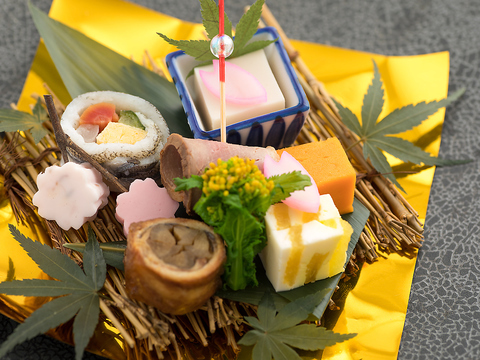 Kyoto – once a prosperous capital of Japan, is famous for its traditional cuisine. Tourists who come to Kyoto all want to try its tofu made from fresh Kyoto water; obanzai which consists of seasonal Kyoto ingredients; and Kaiseki – the most luxurious and tasty course meal signature of Kyoto city. Where can we try this traditional Kyoto dish? Unlike Osaka’s famous street food takoyaki (octopus balls) which can be cooked in any festival stalls, the dishes from Kyoto cannot be enjoyed elsewhere except for certain restaurants inside the city due to its complex cooking method. Most of my friends in university have never tried Kaiseki, partly because it is not widely advertised to foreigners, and partly because it is expensive. A Kaiseki full 11-dish meal can cost up to 15,000 yen. Not a price for students or someone traveling on a budget. If you think the prices are high, think again, since a normal Kaiseki course will cost over 10,000 yen in other restaurants. In The Kyoto Kitchen, they deliberately chose to lower the price so more people can enjoy this delicious dish. And they did so without compromising the quality of the food. The restaurant assures they provide customers food that stands up to Kaiseki standards, but thanks to their efforts, they made it more affordable. 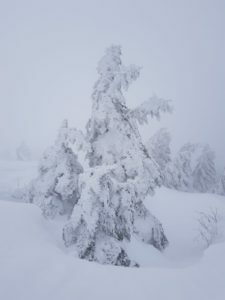 As previously mentioned, the restaurant serves mainly Kaiseki – a traditional course meal which consists of around 9 to 11 dishes, served to dining customers one by one. Kaiseki is a luxurious meal, usually prepared by high-class restaurants and only utilizing the freshest and most carefully selected ingredients. One can tell a Kaiseki dish just by looking at it. In one tiny dish, they can combine a lot of ingredients, each of which is prepared to great detail. Above: Starter Menu. 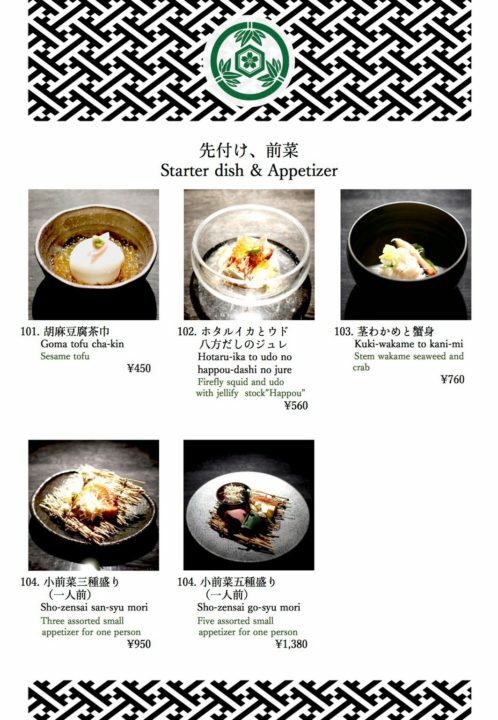 Below: Kaiseki menu. The point of Kaiseki is to eat slowly, in little bites to enjoy the great variety of flavor and also the interesting combination of these tastes. Overall, Kaiseki is complex and refined in both its taste and representation. Seasonal Menu: Normal chain restaurants would have their staple menu and a few occasional seasonal features. However, for Kaiseki, it is all about the season. 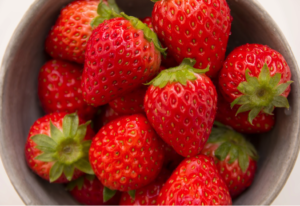 Eating what the season offers is the best way to have the freshest ingredients and to enjoy the season. Most of the ingredients in Kaiseki are edible, even flowers. There are dishes that uses canola flowers and chrysanthemum as edible garnishing. While dinner courses are Kyoto-style Kaiseki, the lunch sets are dishes of Hokkaido – the hometown of the manager/chef Miura-san. When asked what inspired him to create Kyoto cuisine, Miura-san said that his hometown is in Hokkaido, and it was a twist of fate that a friend of his invited him to open a restaurant in Kyoto. He came to Kyoto in April one year ago and learned how to prepare special Kaiseki dish from a traditional restaurant, and finally opened his own shop. Relaxing. Drinking. Having fun. Yes, all of that plus eating the most well-prepared foods. 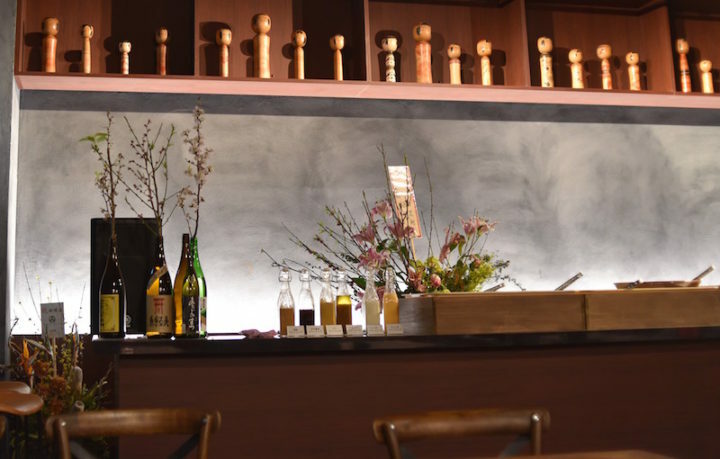 Usually, Izakaya do not serve high-quality food because their focus is on the drinks. And a Kaiseki restaurant is not a place to “have fun” because of its formal atmosphere. 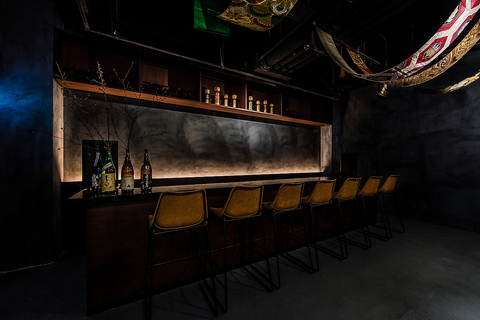 But The Kyoto Kitchen is a hybrid, making it a “casual” Kaiseki restaurant, where everyone can enjoy Japanese traditional food in an authentic but fun way. Friendly and casual wooden seats with a beautifully decorated ceiling. Nowadays eating is not just about filling up our stomach but more about our dining experience. A typical restaurant that serves a Kaiseki course looks like a place for celebrities or government officials to go. The first time I went to eat my first bamboo shoot course meal wearing denim and a sweater, I felt like I was improperly dressed. The Kyoto Kitchen’s restaurant manager/chef Miura says that they do not want their customers to feel stressed when eating a luxurious meal. Here is a place that you do not have to dress up formally or tense up because you are concentrating on your manners instead of enjoying the food. Customarily, Kaiseki is a fixed course that cannot be personalized. But did you know you can design your own Kaiseki course by picking each of the dishes by yourself? You can do that in The Kyoto Kitchen! The chef will gladly listen to your choice and arrange it into a full course. Or if customizing is not your cup of tea, you can choose the chef’s recommendation. 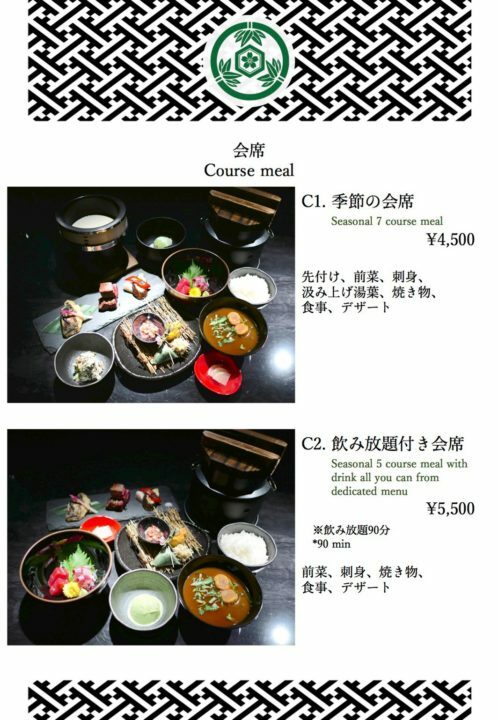 There are two choices: A seasonal 9 course meal (4,500yen) or A 7 course meal with all-you-can- drink (6,000yen). You can eat the course, choose separate small dishes, or customize your course meal as you prefer without any restrictions. Sesame tofu, sashimi, fried eggs, octopus, and pickled vegetables in a container that mimics the carriage used by Japanese warlords. 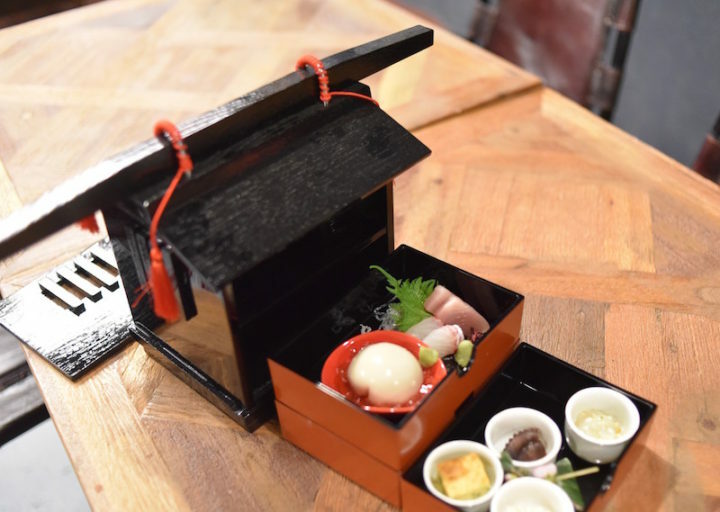 I felt quite lucky to have the chef introduce to me his new idea: a dish which is stored in the box that mimics the carriage of the Japanese warlords. Sliding it open you can see two bento boxes, the first one includes a round piece of sesame tofu and sashimi; and the second one with four side dishes. Miura-san has not come up with the name for the dish yet. But through this, we can see how much thought was put into each Kaiseki serving. Sake lovers! This is a place for you. 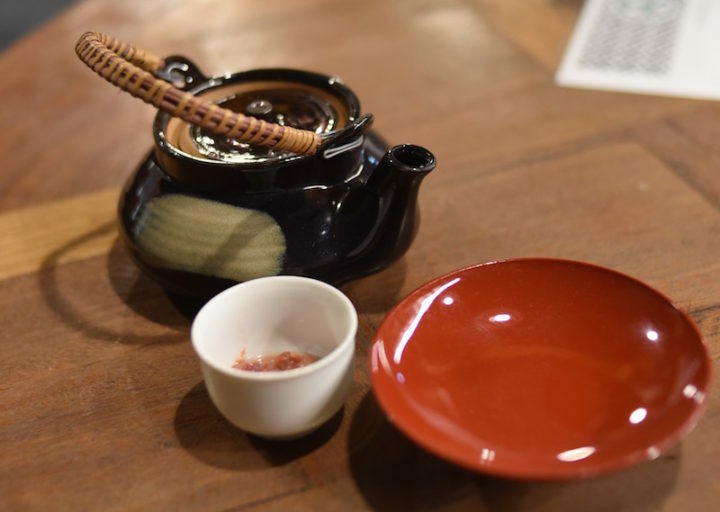 Sake will be served in lacquerware, together with a salty side dish. Thanks to its fresh water and natural ingredients, Kyoto has a rich sake brewing history and is one of Japan’s leading producers. 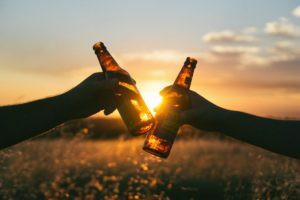 Famous sake brewing sites such as Fushimi area, Matsui Brewery, and Tanzan Brewery in Kameoka city attract many sake lovers from both Japan and overseas countries. 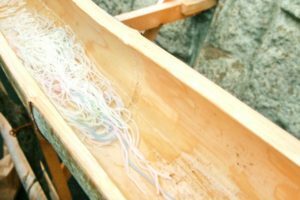 Kyoto city, especially, made a conscious effort to regulate and promote the sake industry in 2013: “through the spread of sake, we can promote the understanding of Japanese culture”. Miura-san – manager of The Kyoto Kitchen takes up this spirit and says he wants to hear everyone cheer “kampai” with sake (usually “kampai” is only said when drinking beer). The first drink – sake kasu used the lees left over from sake production. It is usually an ingredient to make amazake (sweet sake). The other drinks feature matcha flavored and kombu (Japanese seaweed) flavored highball. Weird combination, right? But I kind of want to try it! They also offer Kyoto wine for European wine lovers. Even though Kyoto is not as famous a wine producer as it is a sake producer, the wine of Kyoto is also made with the finest quality. The recommended drink is Kyoto Tamba wine. My first impression when going to the restaurant was the warm lighting and classy wooden design. Fully Kyoto-esque. I looked up and saw hanging kimono belt (obi) as decorations. Large strips of beautiful fabric reminds us of the gentleness and elegance of Japanese women in their kimono. 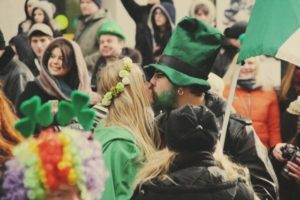 We can see tradition but also the imagination of a romantic mind who thought of using a piece of clothing as decorative arts. Barrels of sake. All sake served in the restaurant is drawn from these containers. If you come here, it is impossible not to let your eyes wander around. Japanese customers, can find their culture revitalized and feel the warmth of their familiar traditional images. For foreigners, it is a place for curiosity. What are those dolls on the wall? Look at all those sake barrels stacked up on the shelves. Every object placed around here oddly matches with each other, and it seems like there is nothing out of place. 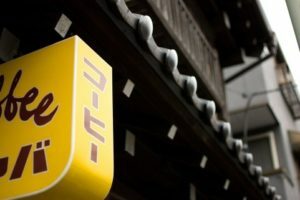 A brand new restaurant but it matches with Kyoto traditional image almost perfectly. Display of Kokeshi – wooden dolls without arms or legs, a typical toy for Japanese kids in the past. Well, that’s it. Are you interested? Let’s invite some friends to enjoy traditional Kyoto dishes at The Kyoto Kitchen! A restaurant with traditional Kyoto style but pricing and the atmosphere is as relaxing as in an Izakaya. 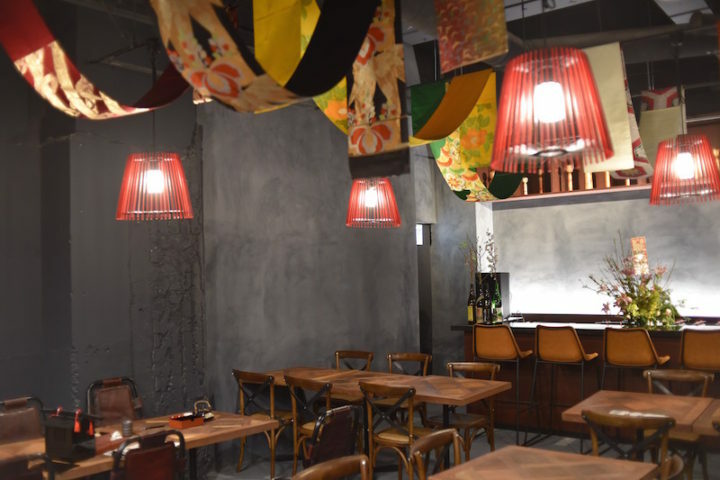 Although the restaurant’s main customers are Japanese people in their mid-thirties to forties, The Kyoto Kitchen wants to introduce traditional cuisine to younger generations and foreigners. 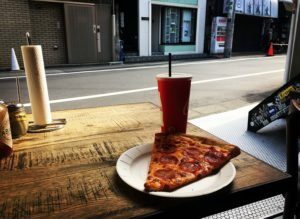 They have staff who can speak English, and a well-made English menu. A bonus is the background music: an unexpected yet very cool Rock n Roll. Unlike other typical Kaiseki restaurants who play koto and shamisen music, the modern jazz and pop music will make you feel energized and unwind after a hard day of work. 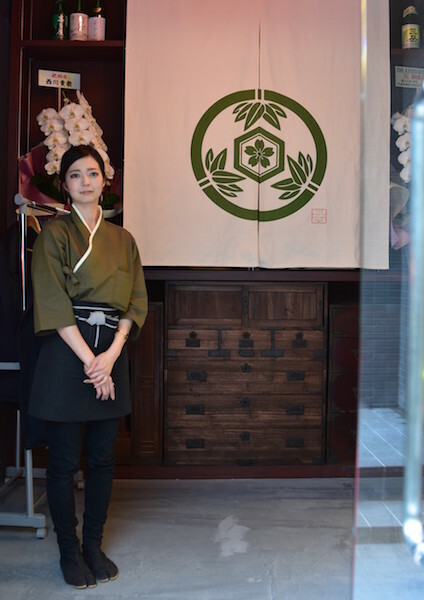 The Kyoto Kitchen’s waitress standing at the entrance next to the restaurant’s symbol. A 5-minute walk from Subway Tozai Line, Kyoto Shiyakusho-mae stop, Exit 3. 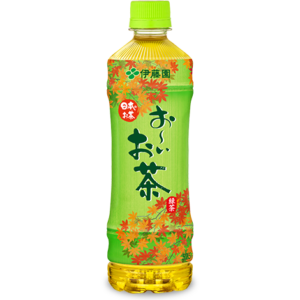 Top 2 Japanese plastic bottle green tea: try it! 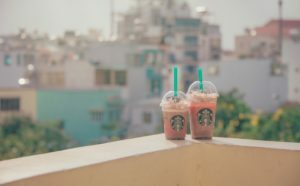 4 interesting facts about Vending Machines in Japan! 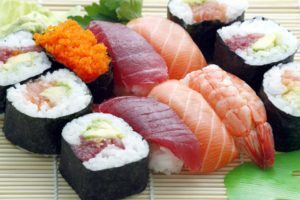 Sushi. 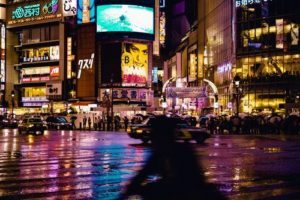 What Is It and What Does It Mean to Japanese People?